As with any heat pump, geothermal and water-source heat pumps are able to heat, cool, and, if so equipped, supply the house with hot water. Some models of geothermal systems are available with two-speed compressors and variable fans for more comfort and energy savings. Relative to air-source heat pumps, they are quieter, last longer, need little maintenance, and do not depend on the temperature of the outside air. Even though the installation price of a geothermal system can be several times that of an air-source system of the same heating and cooling capacity, the additional costs are returned to you in energy savings in 5–10 years. System life is estimated at 25 years for the inside components and 50+ years for the ground loop. 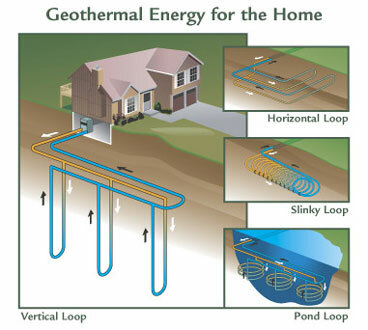 There are approximately 50,000 geothermal heat pumps installed in the United States each year. This cost has been offset with the new tax credit. Call us for details. There are four basic types of ground loop systems. Three of these—horizontal, vertical, and pond/lake—are closed-loop systems. The fourth type of system is the open-loop option. A good water quality is required and manufacture warranties require water testing be done. Which one of these is best depends on the climate, soil conditions, available land, and local installation costs at the site. All of these approaches can be used for residential and commercial building applications. The biggest benefit of GHPs is that they use 25%–50% less electricity than conventional heating or cooling systems. This translates into a GHP using one unit of electricity to move three units of heat from the earth. According to the EPA, geothermal heat pumps can reduce energy consumption—and corresponding emissions—up to 44% compared to air-source heat pumps and up to 72% compared to electric resistance heating with standard air conditioning equipment. GHPs also improve humidity control by maintaining about 50% relative indoor humidity, making GHPs very effective in humid areas. Because of the technical knowledge and equipment needed to properly install the piping, a GHP system installation is not a do-it-yourself project. Contact AEPCOR Geothermal, we will be happy to assist you in finding a qualified installer. Ask for references, especially for owners of systems that are several years old, and check them. Most geothermal heat pumps are automatically covered under your homeowners insurance policy. Contact your insurance provider to find out what its policy is. Even if your provider will cover your system, it is best to inform them in writing that you own a new system.